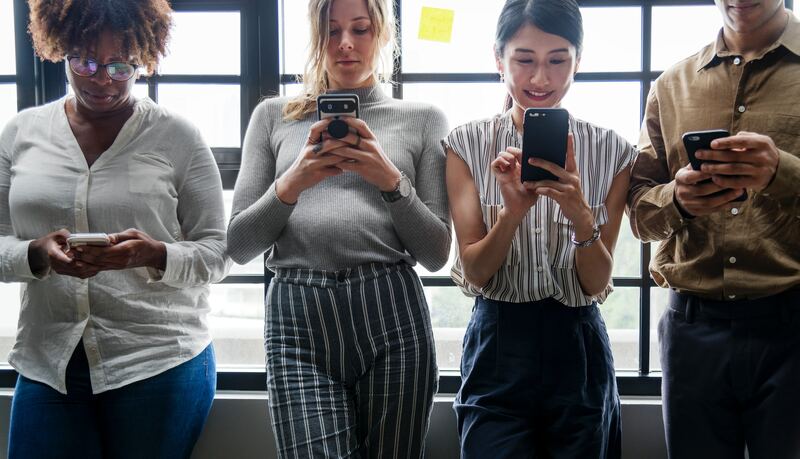 If you’re a marketer focused on the social media space, you know the daily struggle of jumping into the noisy and ever-changing arena and grabbing consumers’ attention. Having a static social strategy just doesn’t cut it. We need to be listening to our consumers and constantly adapting to their needs so that we can be giving them what they really want when their precious seconds of attention fall on our brands. Luckily, our friends at Sprout Social are keeping their finger on the pulse of industry and sharing their findings with marketers to better craft their strategies into the next year. Here are five things they found to consider to ensure that your social strategy is a strong, adaptive plan for your brand. According to the Sprout Social Index 2018, customers’ top three content preferences and marketers’ top three post types are pretty misaligned. 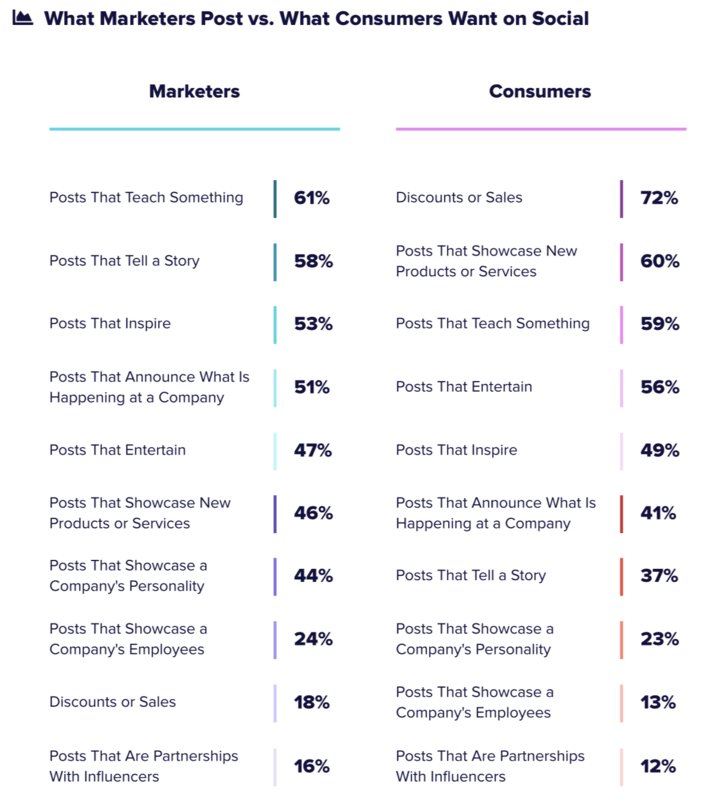 Meanwhile, it looks like marketers’ top post types are those that teach, tell a story, or inspire. If you’re not offering frequent discounts or rolling out a steady cadence of new products, don’t despair,the overlap here is education. While inspiring a customer is great, teaching them something new can go a long way, especially if it gives them new and exciting conversation points with their friends and boosts their social currency. Review your spread of planned post-types and check in with the following stats. Where can you better align your content strategy with what your customers actually want to be seeing? When someone asks what your biggest challenge is as a social media marketer, you’re likely to immediately go to ROI -- and you’re not alone. 55% of social marketers say that measuring ROI takes the top spot in their list of challenges. Luckily, they have new data to help you more accurately predict what actions consumers will actually take when viewing your brand’s social posts. More specifically, they have insight into which content types consumers are most likely to engage with versus share. Check out the stats below and take a deep dive into your social strategy to make sure that the results you’re expecting are aligned with the current interaction trends of your consumers. Gone are the days of social media being the strange new online appendage to your digital brand strategy. Social today carries a lot of weight and isn’t something you can just hand off to an intern to manage (or mismanage) anymore. We’re talking about a branch of your business that has the power to seriously affect your bottom line. According to the data uncovered by Sprout Social, the average marketer fields between 1 and 50 customer service requests each week. That’s anywhere between 52 and 2,600 customer touchpoints facilitated on social media per year! This is due in large part to consumers’ growing desire to address questions and issues through a brand’s social media channel instead of calling a customer service number. Be sure to build time into your social strategy for your team to promptly respond to and engage with customers, addressing complaints, comments, and issues. You’ll build trust with your customers, acquire brand and product insights, and - above all else - you’ll be meeting your customers where they want to met when they need a helping hand. We all know about influencers and their ability to affect product sales with a quick callout during their daily spread of personal updates. Whether the attention garnered is positive or negative (thinking about Kylie Jenner’s Snapchat stock-drop tweet earlier this year), influencers have been deemed so important to helping brands improve their reach that there are now entire departments and agencies dedicated to influencer marketing. This is right in line with supporting what marketers think consumers want, as discussed in #1, but is it in line with what consumers want? Sprout Social’s research says: not quite. The report found that 61% of consumers said they’d be more interested in a company, product and/or service if a friend posted a recommendation. Only 36% of respondents said that they would be as interested in the same post if the recommendation came from an influencer or celebrity. This means that most consumers have more trust and interest in the things that “regular people” are posting about - leading us to turn our attention and marketing budgets to the growing power of micro-influencers and their more relatable interests and levels of fame. If you want to cater your social posts to your consumers’ needs - especially if you are part of a niche market, have a small budget, or want to test and validate your social strategy before scaling up - look into the successful micro-influencers in your industry. Partnering with them may allow you to leverage their small-yet-mighty social clout to better reach and serve your customers. We all know that video content is king in today’s social space and it’s not a trend that seems to be going anywhere anytime soon. While getting started with video production can be a daunting discussion, consumers surveyed prefer brand videos that are polished. In fact, they “produced” 4x more than casual, unedited video. If you want to be doing video right, it’s time to invest in the proper tools and teammates. The good news is: “a majority of consumers (74%) share brand video content on social.” Make it once and see it shared countless times. The videos that are most likely to be shared with friends include content that is entertaining, inspiring, or educational. Note: Getting started with video doesn’t have to be scary. We even have a formula for making great marketing and sales videos here and if you need more hands-on help, consider a video workshop! Social media marketing demands that brands adapt to customer needs quickly. This means taking the time to dig into the metrics and make sure that your social strategy aligns with what your consumers are really looking for when they follow or engage with your brand online. Start small, find what really resonates with your audience, and scale your efforts as needed. The statistics and trends found above are great to start testing! And remember - when you focus your brand’s efforts on giving people what they really want, success will follow.